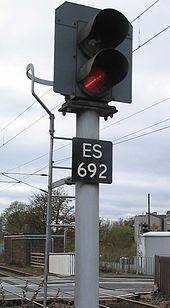 A signal passed at danger (SPAD), in railway terminology of many countries, including Australia, India and the UK (where it is also known as either a SPAD or SPAR), occurs when a train passes a stop signal without authority to do so. The United States's National Transportation Safety Board (NTSB), which investigates railway accidents in that country, typically terms this as running a red signal. It takes a considerable distance to stop a train, and incidents of this type often involve a slight or very slight overrun of the signal, at low speed, because the driver has braked too late, often after sighting the signal too late. In some situations, however, the driver is unaware that they have passed a signal at danger and so continues until a collision occurs, as in the Ladbroke Grove rail crash. In such cases it is up to the safety system (where fitted) to apply the brakes, or for the signaller to alert the driver. A SPAD may also occur because the signal changed to “danger” too late for the driver to stop before reaching it, due to a technical failure. This can also happen in an emergency. Thus, for example, where track circuiting alerts a signaller to a SPAD, and a Stop All Trains message is issued, other drivers will be faced with signals stepping straight down from green or double yellow to red, and further SPADs may result. Automatic train protection (ATP) is a much more advanced form of train stop which can regulate the speed of trains in many more situations other than at a stop signal. ATP supervises speed restrictions and distance to danger points. An ATP will also take into account the individual train characteristics such as brake performance. Thus, the ATP determines when brakes should be applied in order to stop the train before getting to the danger point. In the UK, only a small percentage of trains (First Great Western and Chiltern Railways) are fitted with this equipment. The DRA is an inhibiting switch located on the driver's desk of United Kingdom passenger trains designed specifically to prevent 'starting away SPADs'. The driver is required to operate the DRA whenever the train is brought to a stand, either after passing a signal displaying caution or at a signal displaying danger. Once applied, the DRA displays a red light and prevents traction power from being taken. Whilst the ideal safety system would prevent a SPAD from occurring, most equipment in current use does not stop the train before it has passed the Danger signal. However, provided that the train stops within the designated overlap beyond that signal, a collision should not occur. On the London Underground (for example), mechanical train stops are fitted beside the track at signals to stop a train, should a SPAD occur. Train stops are also installed on main line railways in places where tripcock equipped trains run in extensive tunnels, such as the on the Northern City Line where the Automatic warning system and Train Protection & Warning System are not fitted. On the UK mainline, TPWS consists of an on-board receiver/timer connected to the emergency braking system of a train, and radio frequency transmitter loops located on the track. The 'Overspeed Sensor System' pair of loops is located on the approach to the signal, and will activate the train's emergency brake if it approaches faster than the 'trigger speed' when the signal is at danger. The 'Train Stop System' pair of loops is located at the signal, and will activate the emergency brake if the train passes over them at any speed when the signal is at danger. TPWS has proved to be an effective system in the UK, and has prevented several significant collisions. However, its deployment is not universal; only those signals where the risk of collision is considered to be significant are fitted with it. At certain junctions, especially where if the signal protecting the junction was passed at danger a side collision is likely to result, then flank protection may be used. Derailers and/or facing points beyond the signal protecting the junction will be set in such a position to allow a safe overlap if the signal was passed without authority. This effectively removes the chance of a side-impact collision as the train would be diverted in a parallel path to the approaching train. Prior to the introduction of TPWS in the UK, "SPAD indicators" were introduced at 'high risk' locations (for example: the entry to a single track section of line). Consisting of three red lamps, they are placed beyond the protecting stop signal and are normally unlit. If a driver passes the signal at 'danger', the top and bottom lamps flash red and the centre lamp is lit continuously. Whenever a SPAD indicator activates, all drivers who observe it are required to stop immediately, even if they can see that the signal pertaining to their own train is showing a proceed aspect. Since the introduction of TPWS, provision of new SPAD indicators has become less common. Prior to December 2012, the term "SPAD" applied to all incidents where a signal was passed at danger without authority, and a letter was used to specify the principal cause. Now the term SPAD is only used for what were previously category A SPADs and a new term, SPAR (Signal Passed at Red) is used to describe the former category B, C and D incidents. A SPAD (previously Category A SPAD) is where the train proceeds beyond its authorised movement to an unauthorised movement. A Technical SPAR (Previously Category B SPAD) is where the signal reverted to danger in front of the train due to an equipment failure or signaller error and the train was unable to stop before passing the signal. 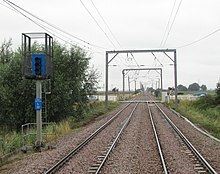 A Signaller SPAR (Previously Category C SPAD) is where the signal was replaced to danger in front of the train by the signaller in accordance with the rules and regulations and the train was unable to stop before passing the signal. A Runaway SPAR (Previously Category D SPAD) is where an unattended train or vehicles not attached to a traction unit run away past a signal at danger. Note that where this was the fault of the driver, this will be classed as a SPAD. SAS SPAD – "Starting against signal" SPAD, where the train was standing at a danger signal and the driver moved past it. SOY SPAD – "Starting on yellow" SPAD, where the train left on a caution signal and the driver did not appreciate that the next signal would be at danger. An automatic signal where local instructions permit it, e.g. signals within tunnels on the Northern City Line. After passing a signal at danger under his own authority, the driver must stop at the next signal (even if it is showing a proceed aspect) and inform the signaller of what he has done. Ding-ding, and away, British slang for a guard incorrectly giving permission to a driver to start away from a platform against a red signal. ^ "Signals Passed at Danger". ORR.gov.uk. Office of Rail and Road. Retrieved 2018-05-12. ^ a b Hersman, Deborah. "Texting: Tomorrow's Unacceptable Behavior". App.NTSB.gov. National Transportation Safety Board. Retrieved 2016-09-11. ^ "Driver fatigue caused two Reading SPADs, says RAIB report". Rail Magazine. Vol. 812. 26 October – 8 November 2016. p. 23. ^ "Managing the risk from fatigue" (PDF). RSSB. Rail Safety and Standards Board. Retrieved 2016-11-21. ^ "Online Rulebook – Module TW1 – Section 10.3" (PDF). RSSB. Archived from the original (pdf) on 2011-09-29. Retrieved 2010-05-16. ^ "Railway Group Standards: Provision of Overlaps, Flank Protection & Trapping" (PDF). RGS. Retrieved 2011-02-18. ^ "Online Rulebook – Module S5 – Section 1.1 "Signaller's authority"" (PDF). RSSB. Archived from the original (pdf) on 2011-09-29. Retrieved 2016-03-04. ^ "Online Rulebook – Module S5 – Section 1 "When a signal can be passed at danger"" (PDF). RSSB. Archived from the original (pdf) on 2011-09-29. Retrieved 2017-06-18. ^ National Transportation Safety Board (January 21, 2010). "NTSB determines engineer's failure to observe and respond to red signal caused 2008 Chatsworth accident; recorders in cabs recommended" (Press release). Archived from the original on February 10, 2010. Retrieved January 23, 2010. UK Health and Safety Exec, Retrieved 8 March 2006.